On Wednesday night I was lucky enough to be a guest at a masterclass with Tetsuya Wakuda at his world-renowned eponymous Sydney restaurant. technology and beautiful art. Tetsuya then cooked 5 delicious dishes for us which he made look so easy and achievable - ah the techniques of a master! They were the 5 courses we ate before our 11 course dinner. 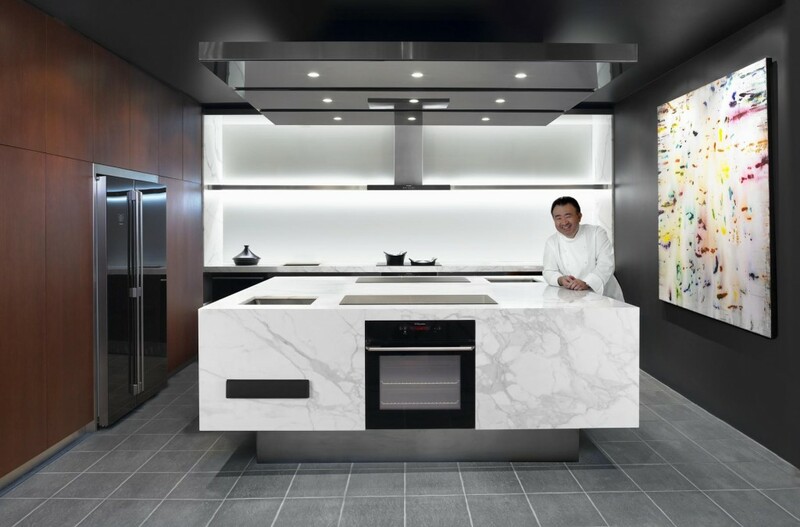 The MasterKitchen: a meeting of aesthetics and functionality, designed by Tetsuya in collaboration with Electrolux. The painting by Julie Harris is one of many works of art in the restaurant. It's scale and colours worked perfectly in the MasterKitchen. Tetsuya is an avid collector of art and he apparently owns thousands of pieces. 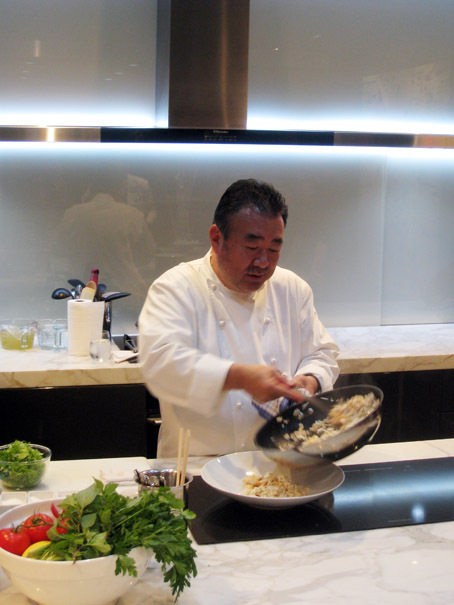 All of the dishes Tetsuya demonstrated for us were made in one or two saucepans. He is big on dinner parties being about socialising and spending as little time as possible in the kitchen. 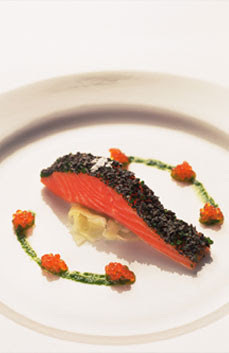 You can see more of Tetsuya's cooking demo videos here, including his signature dish of Confit of Petuna Ocean trout with Fennel Salad. Tetsuya is such a lovely and funny man who's passion for cooking is undeniable. He's also passionate about his Electrolux kitchen, particularly the induction cooktop. And now I want one too! I could almost get by without the expanse of beautiful marble, the tap-less sink (you press a pad with your knee to turn on the water), and the fancy ebony fridge... but seeing how awesome, efficient and responsive that cooktop is... it's just moved to the top of my maybe-one-day wish list. After the masterclass we sat down to our degustation dinner. Our table was close to the open working kitchen and we got to watch the staff (about 6 to 8 of them) skillfully and efficiently preparing the food which is a fusion of Japanese and Western cuisine. 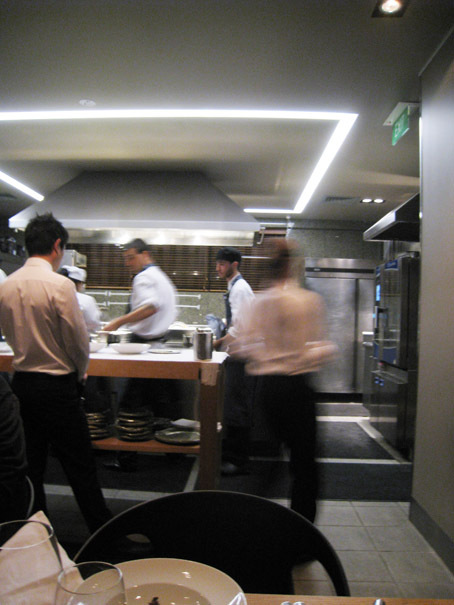 I have eaten at Tetsuya's before, so I knew what to expect: it's a truly amazing experience. Each of the 11 courses had wine to compliment it and I seriously struggled to finish. But as the last 3 courses were desert how could I refuse? As I ran out the door on Wednesday night I grabbed my DSLR and realised the battery was flat. Unfortunately my little camera was hopeless at capturing the food. So apologies for the lack of yummy food shots. I sat with lovely interior designers Jo, Camilla and Jennifer and when we weren't boring the guys from Electrolux with blog talk I learnt some interesting things. I was interested to hear about the design process of Electrolux products and the trends in Europe verses Asia Pacific. I also discovered that they manufacture their ovens in Adelaide and fridges in Orange, NSW. And there's good coffee to be had in Orange! Who would have thought that an energy efficient fridge consumes the same amount of energy as a 40 watt light bulb? I had a great night and staggered (from too much food... I was moderate with the alcohol!) out of Tetsuya's at close to midnight with a full stomach, a copy of Tetsuya's cookbook and a lust for an induction cooktop.